The Trimilin trampoline helps you to escape the vicious cycle of ‘excess weight – inactivity – even more weight’ once and for all. Start with a few minutes of swinging or walking in place on the mini trampoline. Your stamina will increase noticeably after a short time. You can train longer and more intensive. And the best thing is, this type of exercise is a great deal of fun! And this motivates you to continue training on the trampoline regularly in the future. Dr. James R. White, University of California, San Diego, performed a study comparing a treadmill, a stationary bicycle and a mini-trampoline. After 10 weeks, all three groups showed substantial improvements with respect to fitness and fat reduction. However, after one year, he noticed great differences among the participants who still pursued their exercises. Only 5 % of the cyclists and 31 % of the runners still trained regularly. On the other hand 58 % of the mini-trampoline users were still training daily. Therefore, this is not a short-lived training flash. The motivating fun factor of the Trimilin trampoline is a great chance for you to return to an active life. Permanently! Each cell needs nutrients, enzymes and oxygen. Carbon dioxide (CO2) and water (H2O) are produced as waste products. These waste products are disposed via the lymphatic system, the blood and the lungs. The metabolism is stimulated by increased movement and excercise. Fat deposits are burnt away in the process. Each electron, each atom and each cell in our body swings. If all cells and organs in our body are in balance and swing harmonically, we are healthy. Disharmonies and energy blockades create an imbalance and may lead to pain and illness. On the Trimilin trampoline, your entire body is set into harmonic vibration from head to toe without any strain on the joints. Each cell of your body is trained and strengthened in this process. This helps organism to overcome blockades and return to its energetic equilibrium. It reactivates the body`s own regulatory ability. "A rolling stone gathers no moss". Who does not know this old saying? Technical advancement is not always a blessing. We sit in our cars, in our offices, in front of the PC and the TV. Even children suffer from a lack of exercise and overweight or obesity and diseases going along with it. Returning to regular movements and exercise increases health, fitness and vitality and a Trimilin mini trampoline offers a perfect training for your body. Attention deficit disorder (ADD) is an attention and concentration disorder that already starts during childhood. Primary symptoms are easy distractibility, low stamina and large emotional instability. This is frequently also observed in combination with hyperactivity (ADHD). Try out the Trimilin! For children, there is hardly a better way to get rid of excess energy than a few minutes of jumping on the Trimilin trampolin. 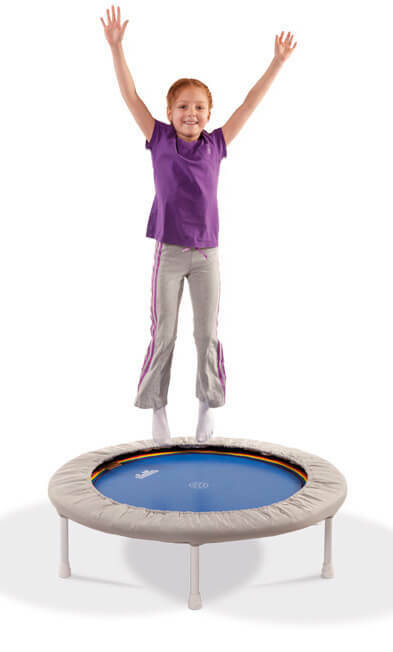 The Trimilin-med is the perfect mini trampoline to sustain the energy of hyperactivity. For smaller children with less weight it may be better to try the Trimilin-miniswing.